I'm so excited to have been chosen as one of the Top 3 at last week's Unscripted Sketches, for this card. It was my first time playing and I really love how everyone interpreted the sketch differently, to make it their own. I turned the sketch on its side and went with an idea that's been in my head for a while. I love to make music cards for musical people and this will be perfect for Kate's piano/vocal teacher (once I find out when her birthday is!). I used the candle from Paper Smooches Hey Sugar set and drew the lines with a ruler. The sentiment is from Hero Arts. Another brilliant idea! 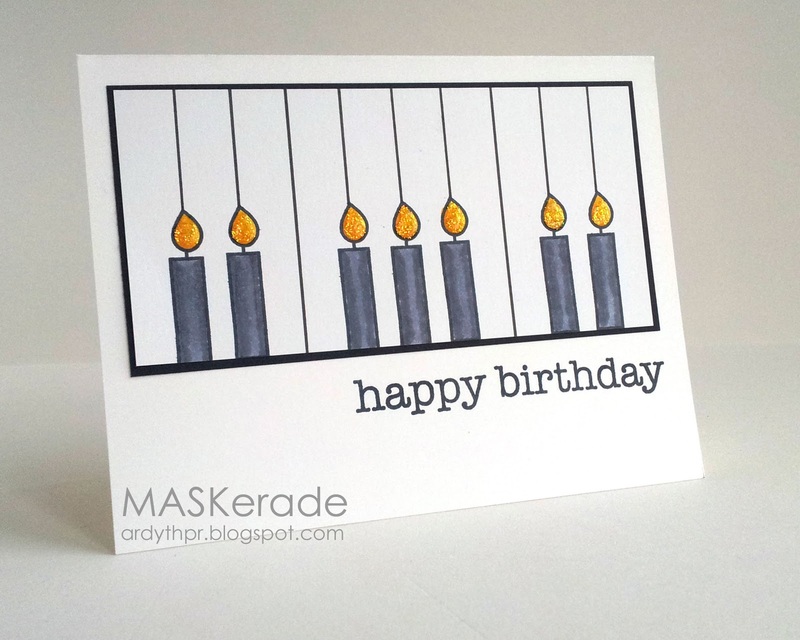 Bithday candles and piano keys...makes perfect sense...once it is on paper. Without actually seeing it executed so perfectly, I likely would have said WHAT??? You amaze me! congrats on the win at Unscripted sketches, another beauty! You are so amazingly creative...this is awesome! Another very clever card, Ardyth, and so perfect for the recipient - I bet she'll be thrilled! Ardyth, I think this is by far one of the smartest and most clever cards I have ever seen! It's gorgeous! WHAAAAT?!? Out of this world creative, you are, Ardyth!! Someone should have had a challenge with the theme "use candles for a music-themed card" and you would have been the only entry because no one else would have thought of anything. Beyond amazing. Oh, and I hope you do get a chance to play around with the ornaments. I would LOVE to see what you come up with! Warning: they are addictive. You just keep making them. Congratulations on the Top 3 honor, Ardy! If you ask me you get the TOP honor for this week's card!! Honestly, I don't even know what to say. You should publish your own magazine of just your cards. Love it! In my brain you had turned a piano into candles so I delighted you explained it and the results would be lovely for anyone musically inclined. Ardyth this is just so creative, the music teacher will love it. Love, love, love it. Too bad you can't use this for the handbell cards. I hope you came up with something because I have no clue with stamps. You are just one of the most creative people out there - congrats on your win - well deserved! What a clever clever sketch design ... love the glittery sparkle ... so glad you joined us at Unscripted Sketches. This is genius!! I never could have visualized such a creative card for a music teacher! Brilliant!! Fabulous take on the sketch! Love it! Thanks for playing at Unscripted Sketches this week! Wow what a great idea...love the candle keys! Oh I love this! So fun and creative!